Micro pigs have gained lots of attention in the press in the past. It was once described as the latest celebrity pet craze, with owners reported to include Daniel Radcliffe, Rupert Grint, Jonathon Ross and David Beckham. Fans of these miniature pigs say they make great pets: they are intelligent, don’t need to be walked, enjoy the company of people and, despite their reputation, are extremely clean. The fact they have hair and not fur also make them suitable for people that are allergic to dogs and cats. However, as with any pet, you must do your research before giving any animal a forever home; this is especially so for pigs, which have a long life and some very particular needs. If you’re thinking of buying a micro or mini pig, please read on for our beginner’s guide to keeping this most unusual pet. What is a Micro Pig? 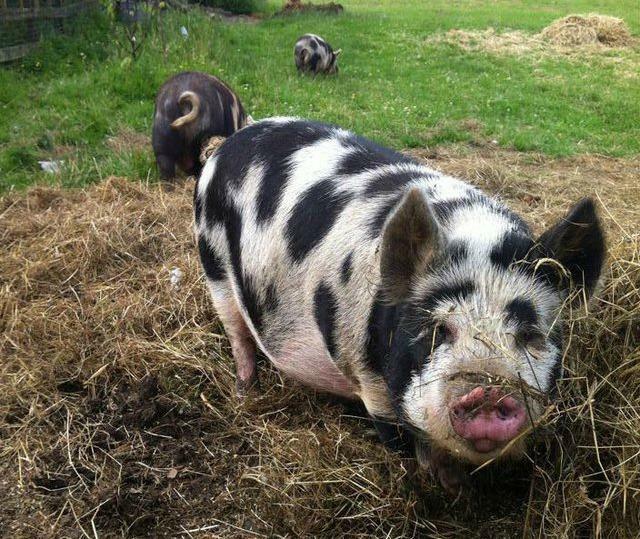 While the micro pig isn’t a recognised pig breed, it generally refers to crosses of the Miniature Pot Bellied pig with Tamworths, Kune Kunes and Gloucester Old Spots. These have been selectively bred to produce pigs that are particularly small in size. Breeds such as the Kune Kunes are sometimes (perhaps incorrectly) described as micro or mini pigs. These breeds do grow to a larger size of up to 30″. Don’t let pictures of tiny little piglets posing next to a teacup fool you; these are probably only a few days old and they will grow! Micro pigs generally grow to between 12 – 16 inches tall (just below knee height), and can weigh between 40 – 65 lb. You may get a idea of their eventual size from their parents; but remember, pigs don’t generally reach their full size until they are 2 years old. Also, because they are cross breeds, their eventual size is unpredictable, so they could grow larger. It’s important to provide any pet with the environment they need and this is no less important with pigs, regardless of their size. Pigs are extremely intelligent and can even be trained in a similar way to a dog. However, this means they need lots of stimulation to stop them becoming bored. They are also a herd animal, so should always be kept in groups of two or more. Pigs have a natural instinct to root, dig, forage and explore with their snouts. It is for this reason that they need plenty of outside space to root and to graze; at least 36 square metres per pig. This should be escape proof. Bear in mind that pigs can be strong, particularly when on a quest for food. In the warmer months, they need somewhere to protect themselves from the sun; as they can get sunburn. In the winter months they will require somewhere warm and dry. Pigs don’t have many health problems, but they will need regular checks from a vet to make sure they are in good health. The regulations put in place in 2001 to control Foot and Mouth Disease require you to register with Defra if you want to keep pigs. This does involve some paperwork, and at first sight can be intimidating. However, it is actually straightforward and simple to comply and there is no cost involved. For more details see our blog post Buying and Selling Goats, Sheep or Pigs. This is only intended to be a beginner’s guide and it’s important to do your research. Try to find a reputable breeder that is willing to take the time to answer questions and help you understand what your new friend will need. Pigs can live for 15 years or longer, so giving them a forever home is not a decision to be taken lightly. However, if you are able to give them the care and attention they need, you will be rewarded with years of fun from these friendly and unusual animals.